The beds are very simple to assemble. They are stacked on a pallet, headboards and endboards on the bottom with the corresponding side rails and security rails on top of the stack. There is a small box (or bag) inside the stack which contains all of the hardware (bolts and lock washers) that you will need to assemble your bed! First, stand up the end boards so that the side with the metal inserts and RED numbers is facing in toward each other. 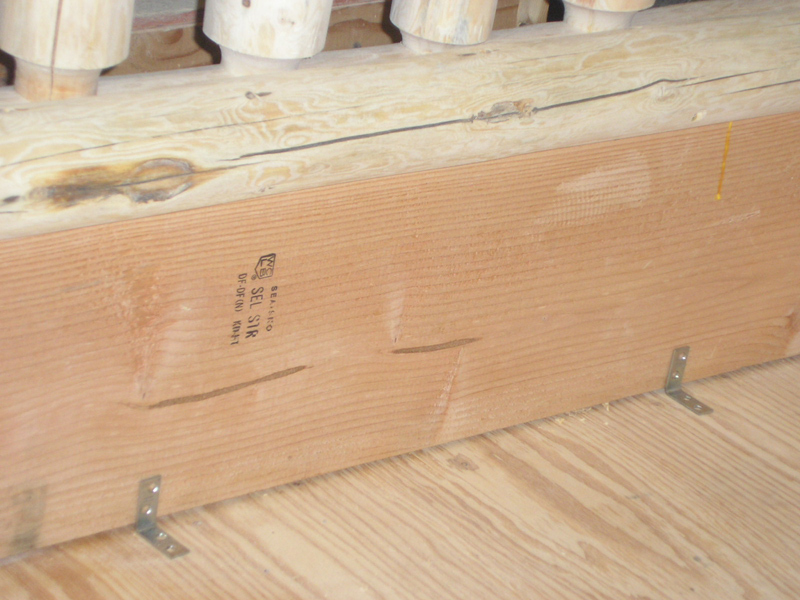 The security rails are marked with numbers on the end of each log as well as inside the corresponding holes. Plug these into their respective holes BEFORE attaching the side rails that have the metal mattress decks on them. DO NOT glue or nail the security rails into place. 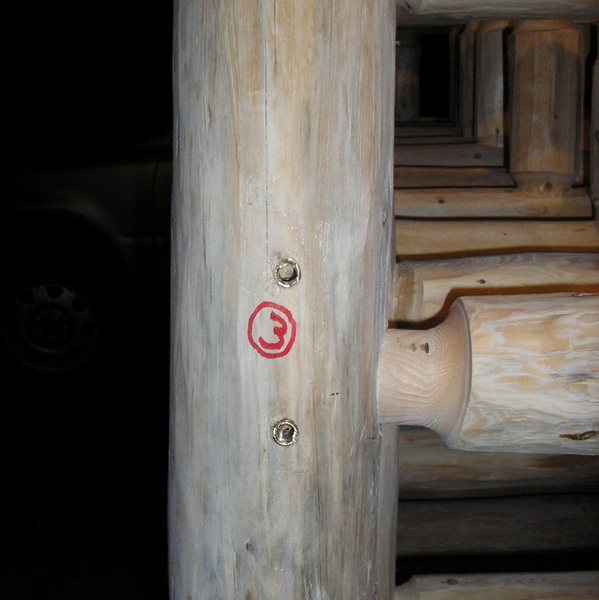 Each set of inserts (top, bottom, left, right) is marked with a RED NUMBER that corresponds with a NUMBER on the end of each rail (half log with the metal rails attached). Simply match up the number on the rail with each set of inserts and bolt them in place, be sure each bolt also has a lock washer. Do NOT tighten the bolts down too snug until ALL of the bolts (16 per bed) are in their respective inserts, some will match up with their inserts better this way. Be careful not to tighten them down TOO tight, snug is more than sufficient. If you are not using a bunky board, once the beds are assembled and in place, you can then cut the slats or plywood to fit each bed. It really is simple and self-explanatory. They should all bolt together very quickly and easily for you. With 2 people per bed, it shouldn't take more than 10-15 minutes to assemble each one. 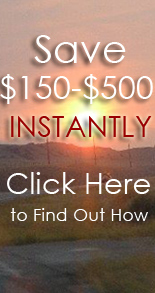 You will need one person for about 15-20 mins to help you. They are stacked on a pallet, head and end boards on the bottom with the corresponding side rails and futon deck on top of the stack. There is a small box inside the stack which contains all of the bolts and lock washers you will need. First, stand up the end boards (left and right ends/arms) so that the side with the inserts and RED numbers is facing in toward each other. 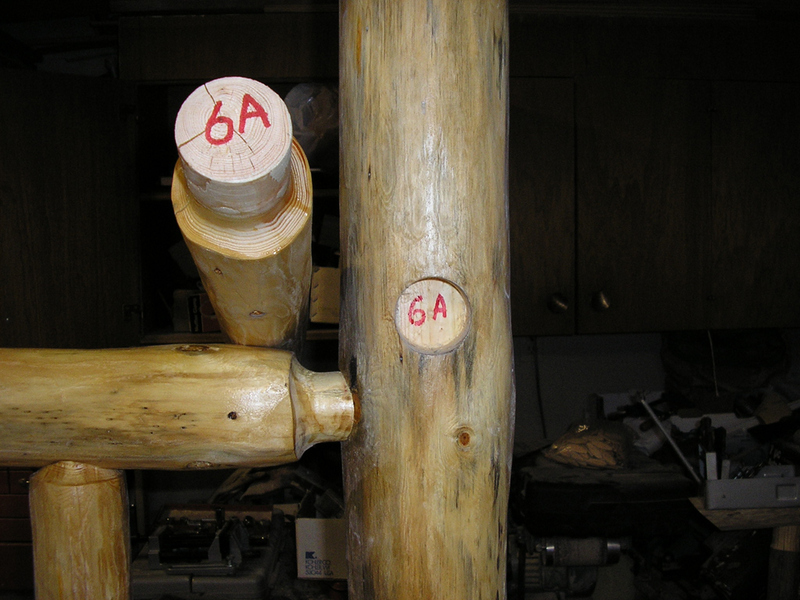 Next, plug the lower futon rails (which are whole logs, that look like a narrow ladder, marked with numbers on the end of each) into their corresponding holes, front and back. Plug these into their respective holes BEFORE beginning on the futon mattress deck. DO NOT glue or nail these bottom futon rails into place. Next, it is easiest if you have something (blocks, books, etc) to set the futon deck on to elevate it in the middle, so you can align the hinges with the metal inserts (the hinges move so you can align them by hand when at the right elevation). The holes for the futon hinges will only match up one way with the inserts on the bottom rail (middle of bed), so if the holes aren't lining up with the hinges you probably need to flip it around the other direction. Do NOT tighten the bolts down too snug until ALL of the bolts are in their respective inserts, some will match up with their inserts better this way. Be careful not to tighten them down TOO tight, snug is more than sufficient. Please note that one of the plywood pieces for the deck (may or may not apply to your model) is not installed/attached on the mattress deck yet. That will make it MUCH easier for you to reach the inserts and tighten the bolts when installing the deck. 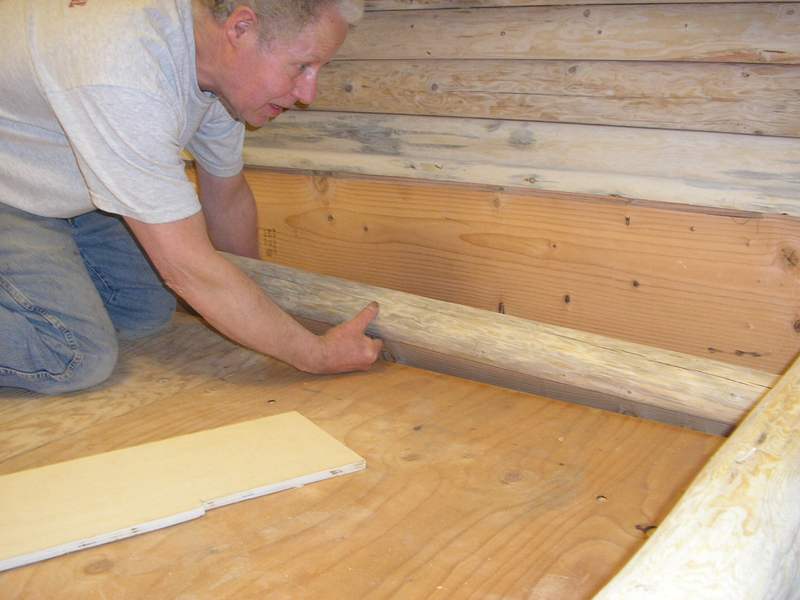 Once the deck is installed, you can secure the loose plywood sheet to the deck with screws or brads. It is already cut to fit, so if it doesn't fit right, turn it over or spin it around so that it fits more precisely. Screws may be better for this so that you can disassemble it at a later date, they will be hidden under the mattress anyway. Let me know if you have any problems. The key is to get the lower rails in first, front and back (remember just plug them in, do NOT glue), then install the futon deck. Be sure the mattress desk is facing the right direction, and elevate it to align the hinges with the bottom/middle inserts. Bolt it into place. Finally, attach the final piece of plywood with screws or brads. Dont make it more difficult than that! You will need one person for about 15-20 mins to help you. 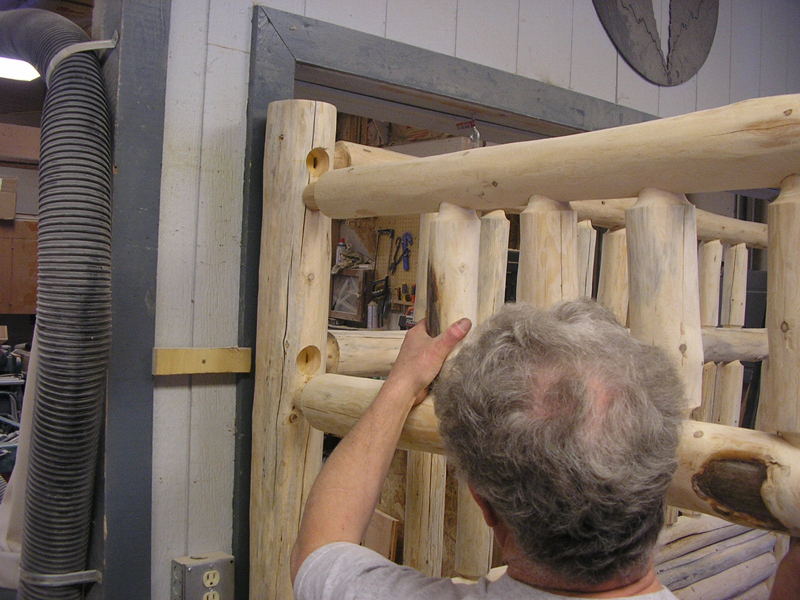 They are stacked on a pallet, head and end boards on the bottom with the corresponding side rails, security rails, and futon deck on top of the stack. There is a small box inside the stack which contains all of the bolts and lock washers you will need. Stand up the end boards so that the side with the inserts and RED numbers is facing in toward each other. 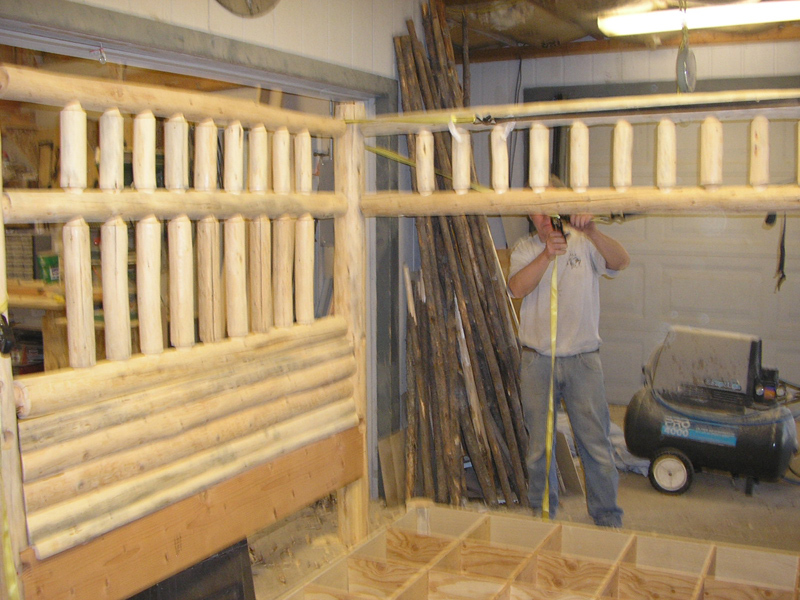 FIRST, plug in the upper security rails and lower futon rails (which are whole logs marked with numbers on the end of each). Plug these into their respective holes (top and bottom) BEFORE attaching the upper side rails that have the metal mattress decks on them and before the futon deck. DO NOT glue or nail the security rails or futon rails into place. Each set of inserts (top, left, right, and bottom middle) is marked with a RED NUMBER that corresponds with a NUMBER on the end of each rail (half log with the metal rails attached) or futon hinge. Install the upper security rails, lower futon rails, and futon deck before the upper side rails. It is easiest if you have something to set the futon deck on to elevate it and align the hinges with the lower inserts (the hinges move so you can align them by hand when at the right elevation). The holes for the futon hinges will only match up one way with the inserts on the bottom rail (middle of bed), so if the holes arent lining up with the hinges flip it around the other direction. Then when the futon deck is installed match up the number on the side rail with each set of top inserts and bolt them in place, be sure each bolt also has a lock washer. Do NOT tighten the bolts down too snug until ALL of the bolts are in their respective inserts, some will match up with their inserts better this way. Be careful not to tighten them down TOO tight, snug is more than sufficient. Let me know if you have any problems. The key is to get the upper security rails in first, then the bottom futon rails (remember just plug them in, dont glue), then be sure the mattress desk is facing the right direction, and elevate it to align with the hinges with the bottom, middle inserts. Bolt it into place, then bolt down the upper side rails for the Twin. Don't make it harder than that! The attached pics will go along in order from lowest # to highest. And the red numbers on the bed itself will also go in order from lowest to highest. Just match them up with their corresponding numbers and it should go together fairly easily. The following instructions will correspond with the numbered pics that are attached. 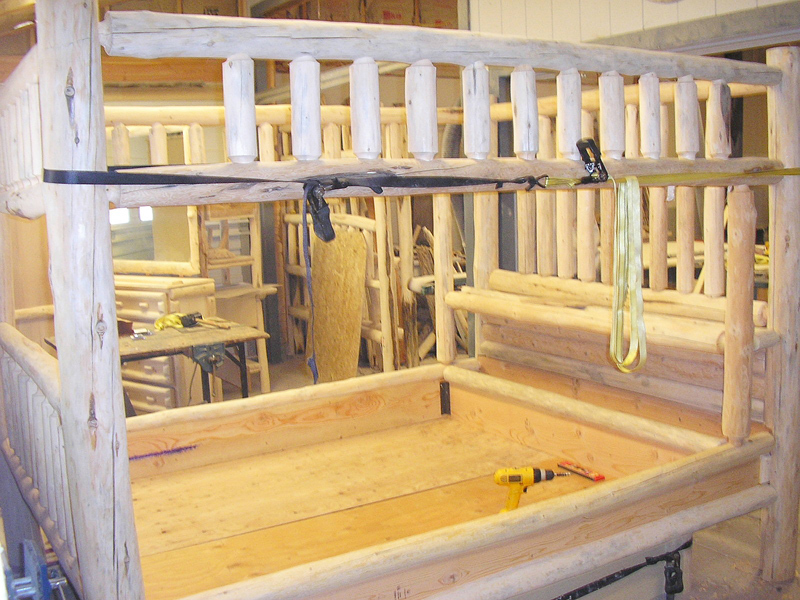 Pic 1 & 2--Stand up the head and footboard facing each other and install the upper canopy first. You should use a ratchet strap to hold it in place loosely, so it doesn't fall on your head. 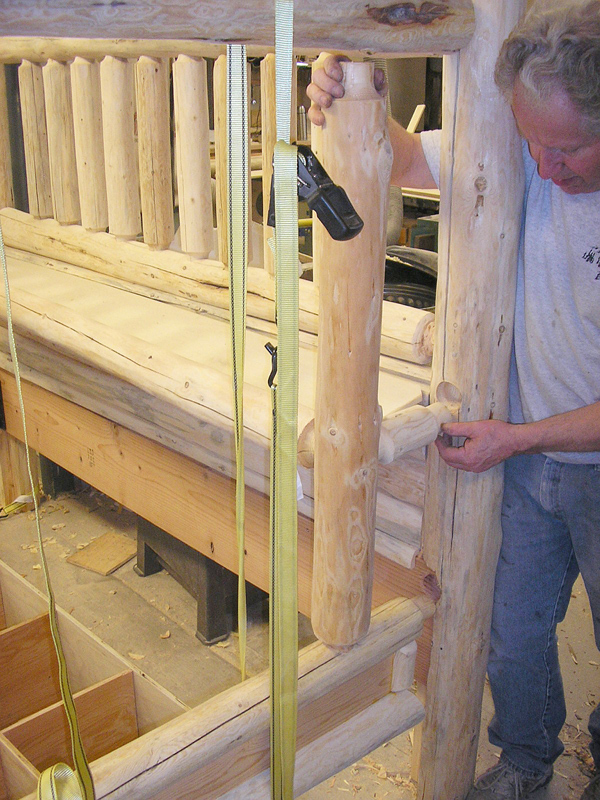 Pic 3--Be sure to slide the footboard tenons on the side rail into the footboard mortises first, then hang the headboard end from above on another strap. 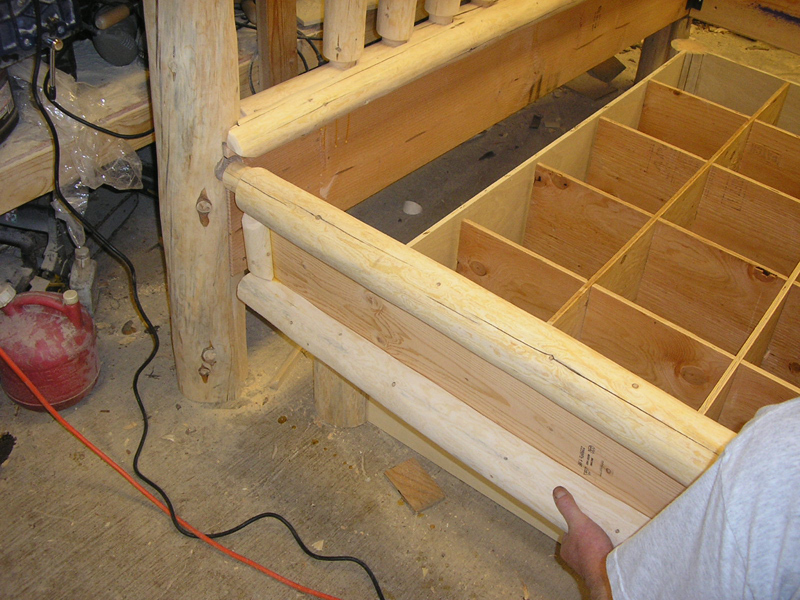 Pic4--You need to install the side vertical support post for the shelves into the top of the side rail, then use the hanging ratchet strap to lift the support post up to align with the respective hole in the headboard, so you can slide #3 tenon into the mortise on the headboard. Pic 5--Another ratchet strap may help you to pull the bottom tenons into their respective mortises, it will help you from beating the posts to pieces. You shouldn't need the pictured strap around the platform deck as shown. Pic6--Once the first side is in place, no screws yet, then you can place the box platform onto the floor. It might be a good idea to brad or glue the corner log pieces onto the side panels of the box. 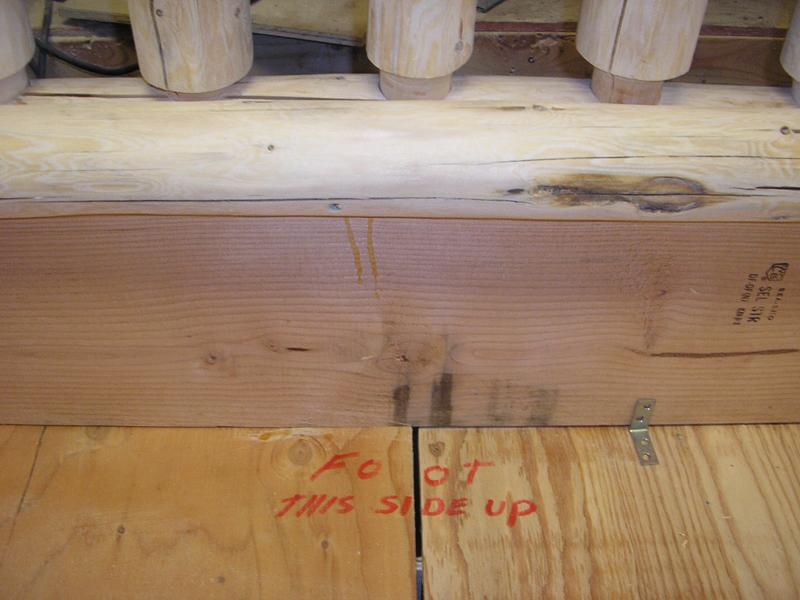 Pic6a--Put one piece of plywood for the top deck in first (they are marked with "Foot, this end up" to show which side of the plywood is up and to the footboard), the second will slip in later after the other side is in place. 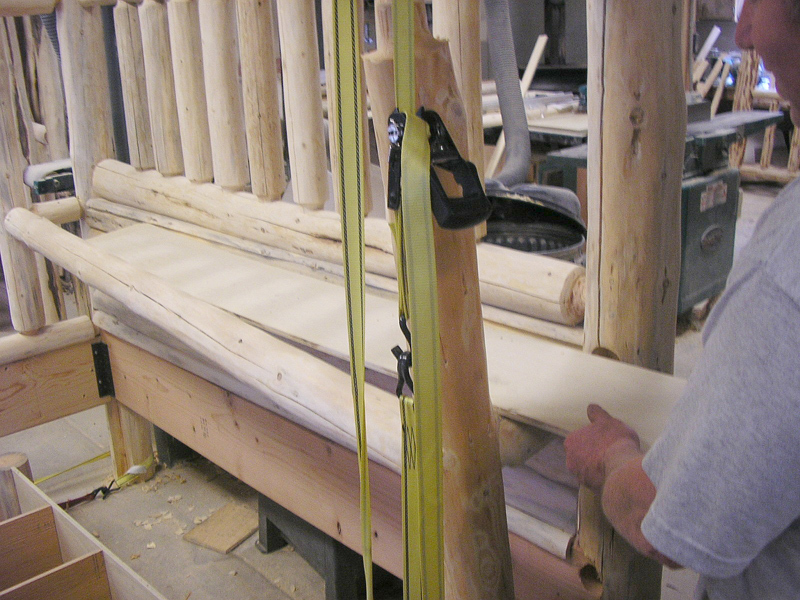 Pic7 & 8--Repeat the instructions for the first side rail, except the front log for the upper shelf (#9 with the slot in it) and the board for the top shelf, needs to be slid into their respective places before the tenon on the vertical post is pulled up into the canopy. 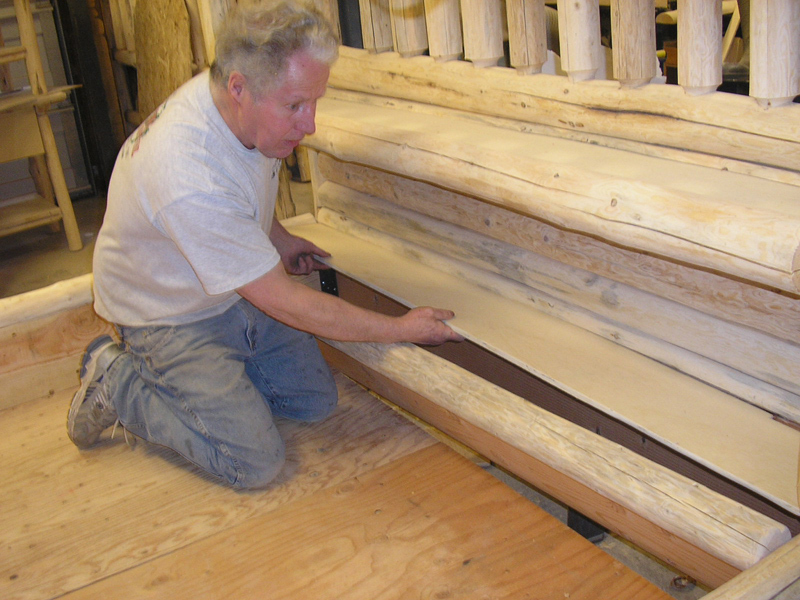 Now put the second piece of plywood down for the deck, and slide them down all the way toward the footboard. 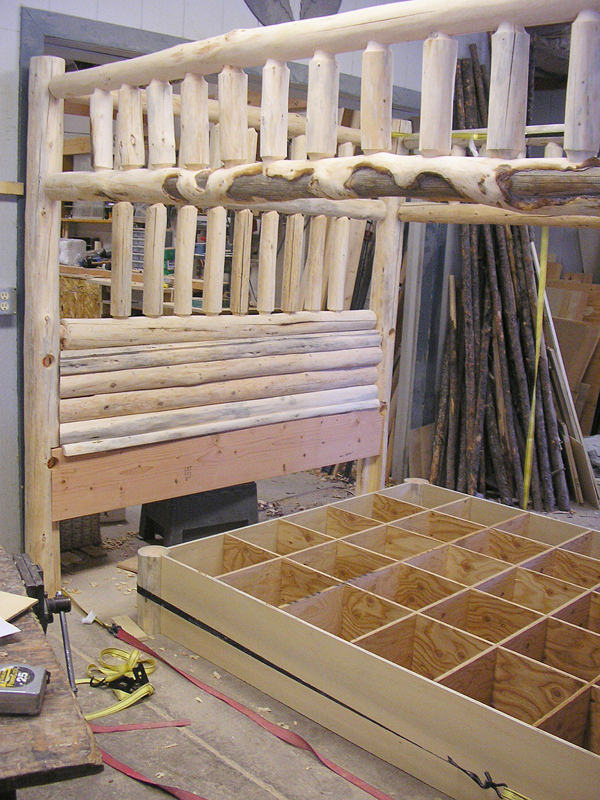 Pic9 & 10--Slide the front head piece of the waterbed box (with the notched log) into place and screw it down. We slid it in from the bottom. Then install the bottom shelf. Pic11--Almost done! Tighten all your ratchet straps and make sure everything is tight. Now go around and screw all the corner brackets in tight. 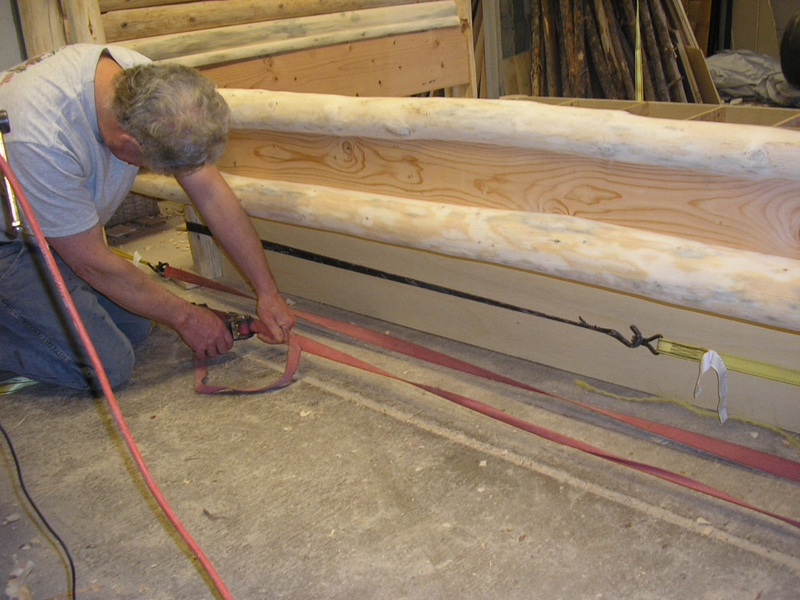 Pic12--Then secure the L brackets to the side rails holding the deck in place. Congratulations! You are now a proud owner of the only Convertible Log Crib on the market today! It is beautifully handcrafted and durable, we are confident you will find that it will serve you and your family well for generations. Upon delivery, you will find all the pieces on your pallet to assemble all three phases of the complete Convertible Crib—including the Crib, Toddler bed, and Full-size bed. 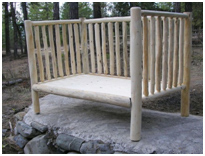 Crib Assembly: The first phase of your 3 beds in One is the Crib. You will not need the 2 individual posts, any of the 3 metal & half-log side rails, or the hardware (bolts & washers). 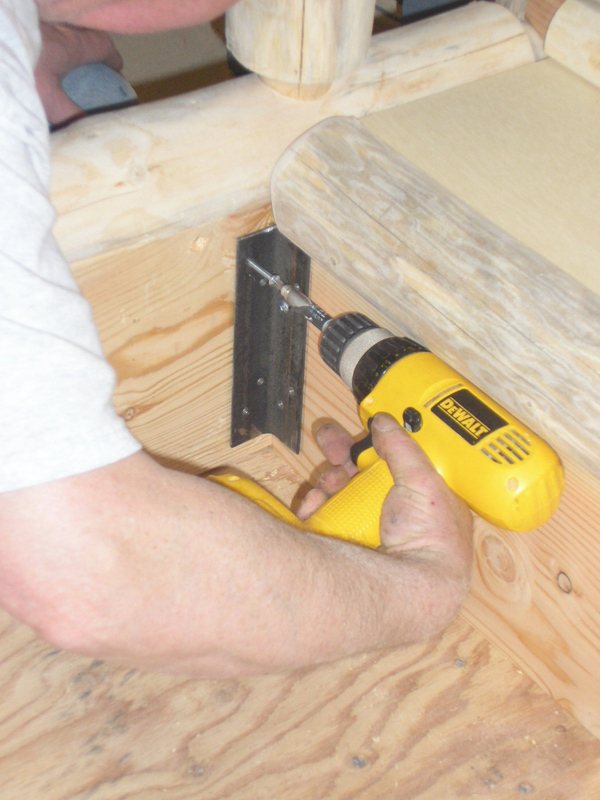 You WILL need eight 2” woodscrews (not included), a drill, and a 1/8” or smaller drill bit. 1. First stand up the Large Back Panel with the 1.5” holes facing you and position the Front Gate directly in front facing the Back Panel, with the holes facing toward the Back Panel. 2. Simply take each of the smaller side panels and match up their corresponding red numbers on the ends with the numbers inside the holes, and slide them in as far as you can (do NOT glue). You might use a rubber mallet (gentler on finished cribs) or ratchet strap to make sure they stay in place. 3. Now lower the plywood mattress deck inside the Crib. Once the deck is in place, you can cinch the ratchet strap down to make sure it is snug on the deck. We cannot glue at this stage if you intend to use the Toddler bed and full-size bed as these pieces will be rotated out, then back in later. 4. Where the Side panel slides into the hole, drill a small pilot hole from the bottom through the “tenon” and into the post, not more than 2” deep. Then you can countersink a 2” wood screw to hold the side panels in place. Do this on top and bottom (all four holes per side panel). 5. 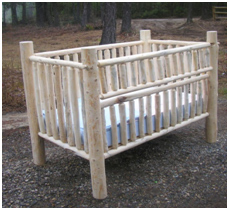 Your new Crib is now complete, simply place the crib mattress inside, and your baby now has a beautiful new Log Crib. Note: The latch on the gate is simple to use. To lock the gate, simply slide the peg all the way in and turn the knob clockwise to lock it. To unlock the gate, simply twist the knob counter-clockwise and slide it back out. Be sure to open both left and right sides before opening the gate. Toddler Bed: To transition from the Crib to the Toddler Bed is very simple and can be done with one person, but 2 people makes it very quick and easy. 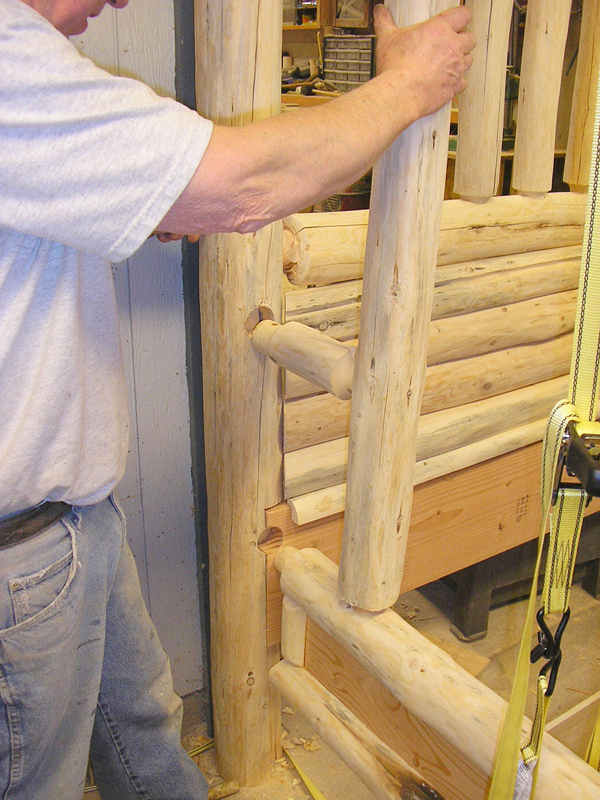 You will need to get the two 46” posts and the short metal & half-log side rail out of storage for this step. Essentially, all you are doing is removing the Front Gate, replacing it with 2 individual posts, and adding a short rail in the front. You will need your drill to remove the screws, and a 7/16” socket or wrench. 1. Remove the mattress and mattress deck from inside the Crib. 2. Unscrew the woodscrews (from Step 4 above) on the Side Panels attaching to the Front Gate, top and bottom both sides, but NOT the ones in the back attached to the Back Panel. 3. 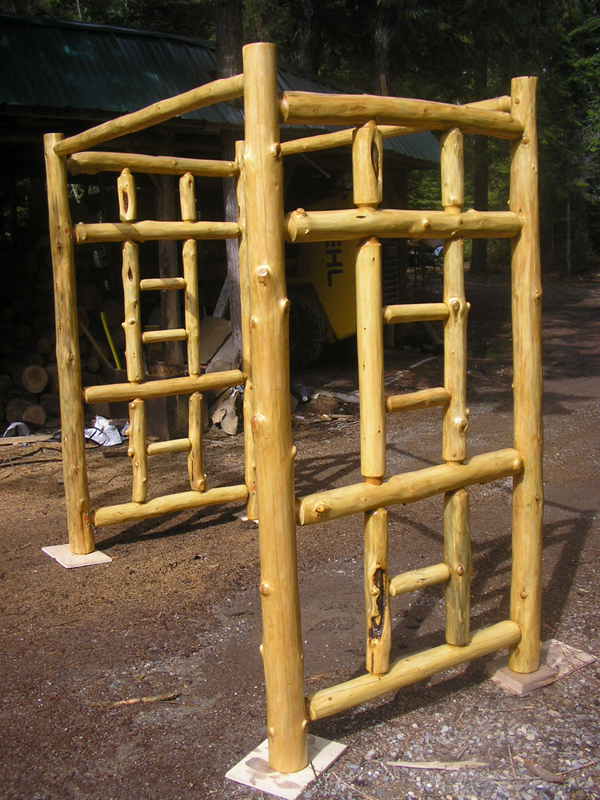 Slide the Front Gate off the Side Panel and replace with the Separate 46”H Posts with the corresponding numbers inside the holes. Do this for both left and right, removing the Front Gate and storing it until ready to transition to the Full-size bed. Using same holes, replace wood screws into front posts. 4. 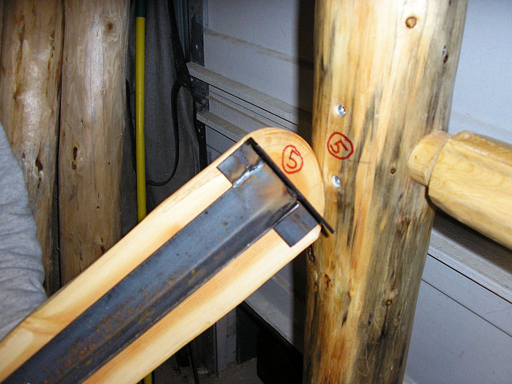 Once the posts are in place, take the short metal and half log rail and match up the red numbers corresponding with the front posts and side panels. Bolt the metal bracket on the small mattress rail into the corresponding metal inserts located on the side rail at the bottom flat edge. You only need 4 of the 8 bolts now, you will use all of them for the Full bed. Do not tighten until all four bolts are at least started half way in their holes. Tighten bolts so they are SNUG, but there is no need to over-tighten as you could pull the inserts out of the wood. 5. Replace the mattress deck and mattress and you are ready for your Toddler to enjoy his/her new “big boy bed”! Full-Size Bed: Transitioning from the Toddler Bed to the Full-size bed is very simple, and you will need to get that Front Gate back out of storage, as well as the long metal & half-log side rails, and the remaining bolts. Now you’re removing the 2 side panels, stretching out the Footboard/Gate with the 2 long side rails. You will need to turn the Headboard/Back Panel around so you can access the metal inserts on the opposite side of the posts. You will also need your wrench or socket again for the bolts. 1. Remove the mattress and mattress deck, and put away in storage until you have another baby or pass it on to your grandchildren. 2. Remove the front short rail by loosening and removing all of the bolts, set bolts aside, as you will need them again for the Full bed. 3. Remove all 8 of the wood screws holding the side panels inside the posts. Remove the Side panels and individual front posts, and store in safe, dry place. 4. Turn the Back Panel/Headboard around so the inserts are facing you and the holes are now facing the wall. Position the Footboard/Gate facing the Back Panel so the inserts and holes are facing the Headboard. Line up the long metal & half-log side rails up on each side with the corresponding red numbers. 5. Bolt the side rails into their respective places, halfway only, do not tighten yet. Once all the bolts are started half way, go ahead and tighten them SNUG, do NOT overtighten. 6. Your new full bed is now ready to accept your full-size mattress and boxspring (not included).